From Standard’s founding to the present, owners have placed an emphasis on acquiring and using authentic hat-making machinery from the era in which modern cowboy hats first emerged. Even today, some of the machinery at Standard Hat Works dates back to the 1860s. 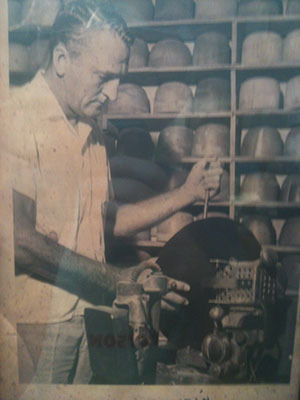 Here, owner Bill Martin stands at a hat roller in the 1940s.